6 June 1944: D-Day: Remembering D-Day: "Fighting Fierce. We Need Help!" The risks were enormous, but so were the potential gains toward final victory. Some of these Allied troops were Native American Code Talkers. Code Talkers, such as the Comanches, had undergone training as Communications Specialists and then months of additional training to devise and memorize a code that included at least 250 military terms and phrases so they could provide secure voice communications on the battlefield. And that's exactly what they did at Normandy. 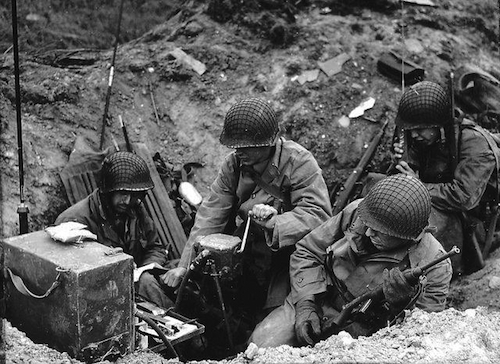 Code Talkers, such as the ones pictured here from the 4th Signal Company, 4th Infantry Division, provided situational reports and called in close air support and direct fire on enemy positions to support their fellow soldiers. Upon landing, they began relaying information in Comanche code. Charles Chibitty radioed the first message from the beach to headquarters: "Fighting fierce: We need help!" The cost in lives on D-Day was high. More than 9,000 Allied Soldiers were killed or wounded, but their sacrifice allowed more than 100,000 Soldiers to begin the slow, hard slog across Europe, to defeat Adolf Hitler’s crack troops. Within three months, the northern part of France would be freed and the invasion force would be preparing to enter Germany, where they would meet up with Soviet forces moving in from the east. Photo shows a Comanche Code Talker (right) using an SCR-536 Handy-Talkie as part of the 4th Signal Company, 4th Infantry Division, from a shell hole on Utah Beach, June 6, 1944. Learn more about the Code Talkers via the link below.